New research, however, is challenging that third tip. As it turns out, the health benefits of milk may be questionable. Milk has long been touted as a healthy drink to help you build and maintain strong bones. This is because milk—along with other dairy products—is high in calcium, a nutrient essential for bone strength. The thinking is that when you supply your bones with calcium, they become more durable and less likely to fracture. But new research out of Sweden is showing that milk consumption doesn’t lower your risk of fractures. Furthermore, it’s suggesting that the more milk people consume, the greater their risk for fractures and death. The reason, according to the research team, could have something to do with the lactose and galactose (sugars) found in milk. It should be noted that the results of the study do not show causation, but rather an observational association. Even with this being the case, I think these findings are worth noting. The sugars found in milk have been shown to increase oxidative stress and chronic inflammation in animal studies. This makes sense, because most animals don’t have the ability to metabolize lactose. Humans, for example, are really one of the only species that can metabolize milk from a variety of species. That said, many humans suffer from lactose intolerance that results in discomfort. The findings from Sweden, however, suggest that bloating and pain might not be all that lactose does to humans. The research team followed more than 100,000 individuals in Sweden (61,433 women and 45,339 men) for an average of 15.5 years (women for roughly 20 years, and men for 11 years). They found that women who drank three or more glasses of milk per day had a higher risk of death than those who drank less than one. They also observed that, contrary to what was previously thought, there was no correlation between milk consumption and fracture risk. The same correlations were noticed with men, but they were less pronounced. Their analysis also showed a strong association between milk consumption and the biomarkers of oxidative stress and inflammation. This association was only found with milk, but not fermented milk products. A high intake of products like cheese and yogurt, for example, did not yield the same results and was, in fact, associated with lower rates of fractures and deaths. So should you dump all your milk down the sink? Not quite yet. More work still needs to be done to determine if milk increases the risk of fracture and death, but these results really don’t surprise me. Lactose intolerance is simply too common, and it’s not unreasonable to imagine that these sugars could cause greater harm than temporary discomfort, gas, and bloating. I also believe the finding that fermented products with less lactose appear to benefit your health. This tells us something about the potential dangers of lactose. Limit your lactose intake if you can by electing to buy lactose-free or reduced lactose products. Dairy is an important and valuable source of nutrition, so I’d avoid cutting it out altogether. 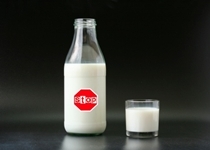 British Medical Journal, “High milk intake linked with higher fractures and mortality, research suggests,” ScienceDaily web site, October 28, 2014; http://www.sciencedaily.com/releases/2014/10/141028214051.htm. Weise, E., “Sixty Percent of Adults Can’t Digest Milk,” USA Today, ABC News web site; http://abcnews.go.com/Health/WellnessNews/story?id=8450036&singlePage=true, last accessed October 31, 2014.